How To Make Waterfall Braids, With a Fishtail Twist! We love the ever popular waterfall braid and have enjoyed experimenting with it. Waterfall braids are very trendy right now and seem to be the "in" hairstyles for 2012, along with many other braided hairdos. 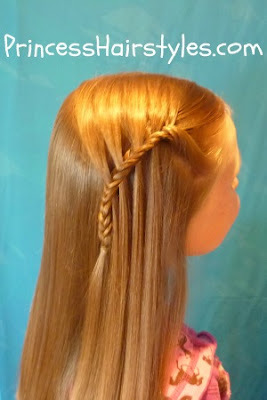 We have done a "waterfall twist braid" along with several variations of the standard 3 strand waterfall braids in the past and wondered if it would be possible to make a waterfall fishtail braid (or waterfall fishbone braid as some may call it.) Yes.... as you can see, it is possible and we actually love how this braid turned out! 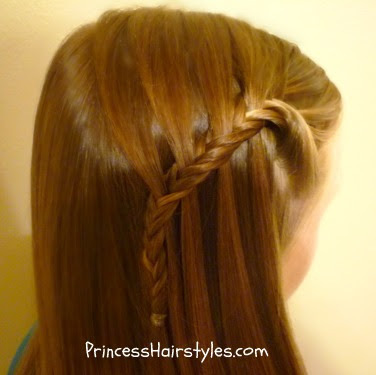 The Princess has been wearing this pretty braid in many braids styles over the past few weeks. We have tried one long diagonal braid across the back of her head, 2 small waterfall fishtails on each side (joined in the middle) a double fishtail braid stacked on top of each other, and even a fishtail waterfall braid updo! The braided hairstyles you can create using this technique really are endless! This hairstyle should work great for long hair, medium hair, even shoulder length hair. If you prefer more of a messy, relaxed hairstyle, you can definitely stretch the strands of the braid as shown at the end of our video. The Princess doesn't wear her long, straight hair down very often because it tends to get tangled quite easily, especially when it's windy out. We usually save hairstyles like this for occasions such as church or low activity/indoor days. Of course, this style could easily be pulled into a ponytail or bun if needed. There are a few ways this braid can be created (including using a topsy tail, the same way we have shown here: Topsy Tail Waterfall Braid.) But, after experimenting a bit, the technique we used in this video seemed to turn out the best for us in the end. Hope you enjoy this unique braid! Pretty! Thanks for sharing. I think I will do this one for my 9yr. old sister tonight before we go to our 12yr. old sister's violin recital. Thanks! hmmm....wondering if i can do this on my daughter's hair, since she has now shoulder length hair. but this is cute also! This blog is great! I like this hairstyle for girls. Because I also girl. you are such a creative and cute mom! could you please tell me where the 1st one is from?